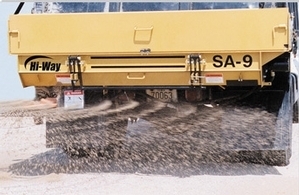 The Hi-Way® SA-9 tailgate spreader is designed for winter deicing and year-round road maintenance. 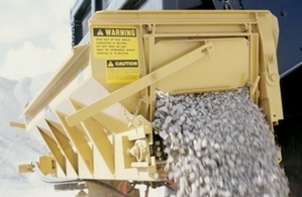 The auger conveys material to the left of the truck for centerline deicing and windrowing or to the right of the truck to berm roadsides and fill trenches with the material chute. Featuring a heavy-duty 7-gauge cover/back plate and a trough with 1/4" (6.44 mm) endplates, the SA-9 comes standard with a an 18" (46 cm) polyurethane spinner disc with six formed fins to protect the hydraulic motor from material impact and provides a superior spread pattern. 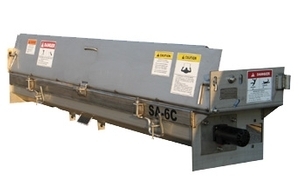 The Hi-Way® SA-6C tailgate spreader features a 6” (15.2cm) bi-directional auger for centerline deicing or windrowing. The bi-directional flighting ensures material feeds evenly from both sides of the dump body to the left-hand discharge area. An easy-open hinged bottom panel allows for one-person trough clean out and quick-disconnect hardware enables easy removal or installation. The SA-6C comes standard with a heavy-duty 7-guage cover/back plate and trough with 1/" endplates; an 18" polyurethane spinner disc with six fines and a direct drive hydraulic motor. Optional equipment includes in-cab control for auger and spinner plus master on/off controls, a 5:1 worm gear drive, and non-painted corrosion resistant 304 stainless steel construction.